We will pick you up from the hotel then transfer to the west bank of Luxor to wander the Valley of Kings where many of ancient Egypt kings are buried in 62 tombs all cut in the mountain rocks and are richly decorated with amazing colors and inscriptions. 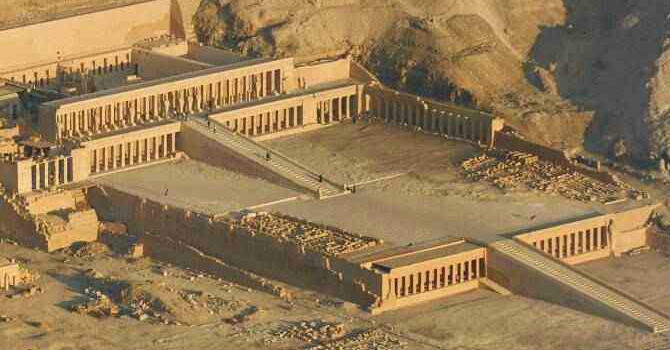 The feateured tombs are for Kings Tutmosis I, Tutmosis III, TutankhaAmon, Ramssess VI, Mrenptah & AmonhotepII. Continue to Al Deir Al Bahary Temple of the famous Queen Hatshepsut, the daughter of king Thutmosis I and the only woman ascended the throne of Egypt for about 20 years in the eighteenth Dynasty 1490 to 1469 B.C. Stop at the 2 quartz colossi status of of Memnon, the remains of king Amenhotep III mortuary temple then transfer back to the east bank to get your lunch meal in local restaurant and Continue to the impressive temples of Karnak. Believed to be the biggest example of worship places in ancient history, devoted to the sun god Amun, his wife Mut & their son Khonsu. Finally you will get a wonderful chance to visit the temple of Luxor, constructed first by king Amunhotep III in eighteenth dynasty during the New Kingdom and it was later finished by the famous king Ramesses II during the nineteenth dynasty. Transfer back to your hotel.